Rubber Anti-tack Agents Market size was valued at USD 316.4 million in 2015 and is forecast to experience gains exceeding 4% CAGR over the forecast timeframe. Global rubber anti-tack agents market size is mainly driven by increasing product usage in tire manufacturing. Rising modifications in rubber processing and rapid growth in end-user industries such as automotive will positively influence the industry growth over the forecast timeframe. Various types of rubbers such as styrene–butadiene rubber (SBR) and nitrile rubber (NBR) are used in the tire manufacturing owing to its impermeable nature. SBR is being increasingly used in the tire industry due to its property to offer better oil and abrasion resistance. It also offers better grip and lower rolling resistance. Additionally, global tires market was approximately 3 billion units in 2015 and is anticipated to reach 4.2 billion units by 2024 owing to positively influence industry growth. The product is used to remove the cohesive property of rubber products, which are then used in end-user industries such as medical and industrial. Rubbers, such as nitrile butadiene rubber (NBR), play an important role in the medical field, serving multiple purposes. One of the major NBR applications is the nitrile gloves manufacturing for medical and industrial purposes. These gloves are used to prevent transmission of viruses from one source to another, which makes them vital in healthcare industry. Increasing health concerns and awareness related to prevention of transmission of viruses and rising need for safety in industries are major factors driving NBR rubber gloves industry growth. This, in turn, is the key factor propelling the global rubber anti-tack agents market size over the forecast timeframe. Stearic acid is a key feedstock stearate production. It is generally present in animal and vegetable oils & fats. Vegetable oils and fats include palm oil, shea butter, cocoa butter & soy oil. Rising oleochemical prices negatively impacts the rubber anti-tack agents market price trends. For instance, palm oil price stood at approximately USD 1,420 per metric ton in 2010. Certain stearates including lead, are under serious threat due to environmental regulations associated with them. These are primarily used in PVC processing and compounding applications. Furthermore, zinc stearate is another product that has been witnessing limited usage due to stringent environmental regulations owing to hamper industry growth by 2024. However, increasing SBR production and usage, particularly in Asia Pacific, in end user industries such as automotive has created new growth opportunities for the industry participants. 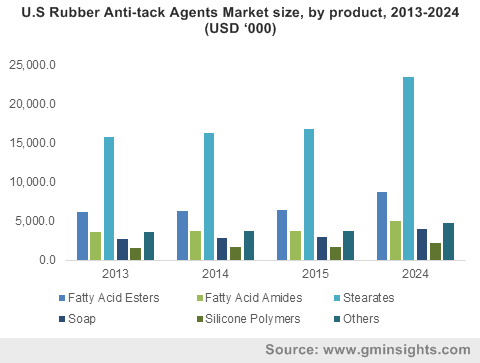 Stearate based rubber anti-tack agents market share was dominant in 2015. However, the segment is analysed to witness slow gains owing to stringent environmental regulations. Fatty acid esters used in the industry generated revenue more than USD 55 million in 2015. Glycerol monostearate (GMS) and natural fatty acid esters such as isoamyl laurate are also used in uncured rubber. These are of the key materials used to eliminate substrate adhesive property. Soaps used as anti-tack agents are projected to witness gains exceeding 4% CAGR over the forecast timeframe. Soaps or slab dips as release agents serve an important role in rubber compounds processing and uncured rubber polymers. These processing chemicals are used to avoid adhesion during storage and help in enhancing production yield and performance during the manufacture of rubber. Slab dips used in the rubber industry are powdered water-dispersible agents that are manufactured as liquid soaps. North America, led mainly by the U.S. rubber anti-tack agents market size was valued at over USD 40 million in 2015. Regional growth is mainly attributed by rising awareness to maintain hygiene by restricting virus and bacteria transmission. In addition, the U.S. has the largest aging population globally, which increasing nitrile glove demand due to large number of nursing homes and high medical expenditure. Asia Pacific, mainly led by India, Malaysia and China rubber anti-tack agents market share was dominant in 2015 and is forecast to experience gains more than 4,5% CAGR over the forecast timeframe. The growth was majorly driven by robust growth in the regional automotive industry. In addition, Malaysia is the largest rubber manufacturer globally owing to boost industry growth by 2024. Global rubber anti-tack agents market share is moderately consolidated with major industry participants accounting roughly around 40% of the global share in 2015. Schill + Seilacher, Baerlocher, Evonik, H.L. Blachford and the Hallstar Company are major industry players. Other prominent industry share contributors are Lion Specialty Chemicals, Croda International, King Industries, FACI SPA, Peter Greven GmbH, SASCO Chemical Group, McLube and Stephenson Alkon Solutions. The industry is witnessing high competition among major players in the past few years due to high capital expenditure. Intense competition is evident among major players in the market, especially in Asia Pacific and North America owing to presence of major production facilities for fatty acid esters in these regions. Various manufacturers have entered partnerships and collaborations with raw material suppliers in strategic regions such as Asia Pacific. These partnerships are expected to lower raw material procurement costs for producers. Additionally, these manufacturers have established production facilities in several regions to cater to growth in the end-user industry in Asia Pacific. Key players in the market constantly strive to increase their profitability through new product development and technological advancement. Anti-tack agent demand in tires has been increasing due to rapid growth in the automotive industry. Anti-tack agents are widely used in the rubber industry for eliminating the self-sticking property of rubber substrates. However, growing modifications in processing and rapid production in end-use industries such as automotive is fueling demand.